It is not only moms and dads, grandmothers and grandfathers who are proud of their high school graduates this year. At the McFaddin-Ward House (MWH), a host of folks are taking pride in the accomplishments of several great kids who are setting their sights on the future, continuing their education—growing up! And why shouldn’t we be proud? We often joke that we’ve helped rear these kids, these junior interpreters. It is, of course, a little tongue in cheek, because although we do spend time with them, grow to care about them and wish for them the brightest future possible, we leave the actual rearing to the parents. We had lots of JIs who persevered with our museum program and graduated from high school while still in the JI program. We’ve actually had several who continued to volunteer while in college. That says volumes about our program. But this year we have quite a few graduates with such a wide variety of backgrounds and high school experiences that it seems important to call them by name and share their plans for the future. In alphabetical order meet Christina Abel, a homeschool graduate, who has a long history with the McFaddin-Ward House. She started as one of our “kids” coming for afterschool programs and eventually became a junior interpreter. It has been the museum’s good fortune that Christina’s homeschooling enabled her to volunteer much more than the average middle and high school student; so she’s devoted over 300 hours to the MWH since becoming a JI. Now Christina plans to pursue other avenues: beginning an internship with a local independent film company, self-publishing three novels, and attending Lamar Institute of Technology to pursue a degree in graphic design. WOW! It will be so much fun to continue to watch this amazing young lady follow her dreams. Hannah Colletti will graduate valedictorian of her class at Legacy Christian Academy this May. She is very bright, to say the least, and very personable as well. This young lady will go far. She actually served as an intern for the museum’s collections department the summer she completed her junior interpreter training. I’m not sure if that was the hook, but she will be enrolling in the Honors College at Stephen F. Austin State University in Nacogdoches, Texas this fall, majoring in History and minoring in Anthropology. Montshonae “Katy” Lowe is her mom and dad’s pride and joy. I’ve seen that from the first moment I met the family. She is special. Hard-working, fun-loving and anxious to grow up, Katy is graduating a year early from Central Medical Magnet High School. Katy admits that she started the admission process a little late but plans to attend Oakwood University in Huntsville, Alabama. It is hard to imagine Katy off at school, because I know her parents and little brothers will miss her terribly. But she is a determined young lady who can do whatever she sets her mind to. Tori McGuire entered the junior interpreter program a little older than most teenagers. Even when she first began you sensed a quiet maturity about her. She could drive herself—that was a big deal—and soon began working after school and on the weekends. Tori is very interested in history and old “stuff.” She likes to write about that subject and others. That must be why this West Brook High School honor graduate is entering the Communications College at Texas A & M University; not only is she smart as a whip, but she knows, at the tender age of 18, what kind of career she wants to pursue. Finally we have Kirk Schiesler who’s been a junior interpreter for five years. He has always been in the minority—most of our JIs are girl. But he never seemed to mind. Kirk has always been devoted to his church and to his country. For more than a few years he’s been a member of ROTC at West Brook High School. In pursuit of his dream of a military connection in his life, Kirk is enlisting in the Naval Reserves upon graduation. He will start at Stephen F. Austin University in the fall majoring in agricultural mechanics—sounds hard! These young people are one and all the best and the brightest, because fortunately our junior interpreter program attracts excellence. We congratulate each of them on their hard work and support them in the decisions they make about their bright futures. You are all our pride and joy. Thanks so much for sharing your time with us over these special years. The museum’s spring community picnic, held at the carriage house grounds, was a rousing success, with live music, beautiful weather, and demos at the Victory Garden. Picknickers relaxed, ate, listened to live music, and tasted homemade gazpacho made with fresh herbs from the garden. The Victory Garden was restructured over the winter to reflect recycling as well as McFaddin history; the flagstones around the border came from the former site of the pond between the historic oaks, and the wine bottles hark to the beer bottles that once lined the kitchen garden beds. The event inspired a new museum program: “Roots ‘N Shoots” which combines a family picnic with an educational foodways programs at the Victory Garden. The first Roots ‘N Shoots event will be June 28, from 5:30-7:30 on the carriage house grounds. It is always very surprising when summer arrives, because one minute it’s spring, then you blink your eyes and BAM, it’s HOT! That certainly holds true for the spring and beginning of summer this year. The spring was an extremely busy one for the McFaddin-Ward House volunteers. Now, as we close in on the official beginning of summer, we don’t expect it to slow down one bit! Spring began just a bit early for the museum staff and volunteers when the McFaddin-Ward House, along with all the museums in the Golden Triangle, hosted the Texas Association of Museums (TAM) Annual Conference at the beginning of April. Conference attendees spent a lovely evening at our museum—most said it was the highlight of the conference! We were able to show off our wonderful museum properties, plus we showed off the 26 volunteers, adult and teenage, who helped with the event. The museum also held several public events in April, where junior interpreters and docents led tours; and our education volunteers stayed active visiting four nursing homes in April and May. Ten volunteers who enjoy working with youngsters traveled to Silsbee with staff to present the museum’s fun program, Old Time School Days, to nearly 70 fourth graders. Just before school ended for the summer, 300 students from Odom Middle School visited the museum over three mornings and kept us hopping. It took 13 adult and teenage volunteers each day, plus staff, to make sure that every student toured the house and the carriage house, watched the play “A Morning with the McFaddins,” and enjoyed hands-on activities at the visitor center. It was the second year we have managed to make this really big event happen, and it is all because of our amazing volunteers! The Volunteer Service Council (VSC) members enjoyed some fun activities this spring as well. In April, 30 volunteers and staff took a tour of landmarks in and around Beaumont that were important to the McFaddin and Ward families. Staffer Judy Linsley compiled research on the various locations and shared that information throughout the trip. The volunteers pronounced it one of the best get-togethers ever! In May, 42 adult volunteers and guests traveled to Nottoway Plantation in White Oak, Louisiana, where they enjoyed tours and a fantastic lunch. These day trips are a real camaraderie builder for the VSC, and the social hospitality committee makes it even better by serving great refreshments going and coming! Adult volunteers also enjoyed a special preview of the summer and fall exhibit installation in late May. Again the social/hospitality committee of the VSC prepared and served delicious appetizers for the occasion. The curatorial staff explained the interpretation and led the volunteers on a tour through the new exhibit. The McFaddin-Ward House Book Club met in May to discuss The Lost City of “Z.” The book club continues to be a popular quarterly gathering. Each time, members read a chosen book; one takes the lead in the discussion and everyone enjoys a catered lunch! The next meeting will be in August. In July the VSC will hold a general meeting for all members featuring a local interior designer discussing the use of color in decorating. Members will enjoy a “covered dish” meal (always a huge hit!) and get some insight about interior design, something that Ida McFaddin and Mamie McFaddin-Ward also did many years ago. The social/hospitality committee will be in charge of preparations and decorations for this event. The education committee will be busy this summer presenting “Digging in the Toy Box,” a really fun hands-on look at toys through history, to local libraries. Committee members will also be “hands on” with the museum’s summer camp “Tried and True: Teaching Traditions” in late July and early August. Junior interpreters were most helpful this spring with the TAM Conference—ten teenagers were here on a school night until after 9 p.m.—to share their training with our visitors. Later in April, when the museum participated in the Magnolia Garden Club’s event “Through the Garden Gate,” JIs gave tours of the first floor to dozens of visitors. The museum’s summer Junior Interpreter training class will begin on Monday, June 17. Interested teenagers (13 or older) should call Becky Fertitta for information (409) 832-2134. There is an application process and the deadline for applying is June 10, 2013. These well-trained teenagers give tours throughout the year on special JI Guide Days, as well as volunteer for other activities. Become a McFaddin-Ward House Volunteer! Have you ever thought about becoming a volunteer at the McFaddin-Ward House Museum? Now is your chance! We have opportunities for ages 13 and up. All you need is an interest in history and to be able to devote time to training and volunteering! We are accepting applications now for summer training. For more details, contact us or visit our volunteer information page for more details. Mark your calendar for our next free event at the McFaddin-Ward House. Join us for a fascinating lecture by David Bush to learn about Dallas’ 1936 Texas Centennial Exposition and the public spaces, buildings, sculptures, and murals that were designed for the occasion. Fair Park is said to be one of the best collections of Art Deco architecture in the country. Here’s a sneak peek at what we’ve been working on in the McFaddin-Ward House Victory Garden. Be sure to stay tuned for more photos. We are looking forward to spring! — with Carol J. Cuccio and Allen Rienstra. In celebration, we wanted to share another fun postcard from the museum’s collection. 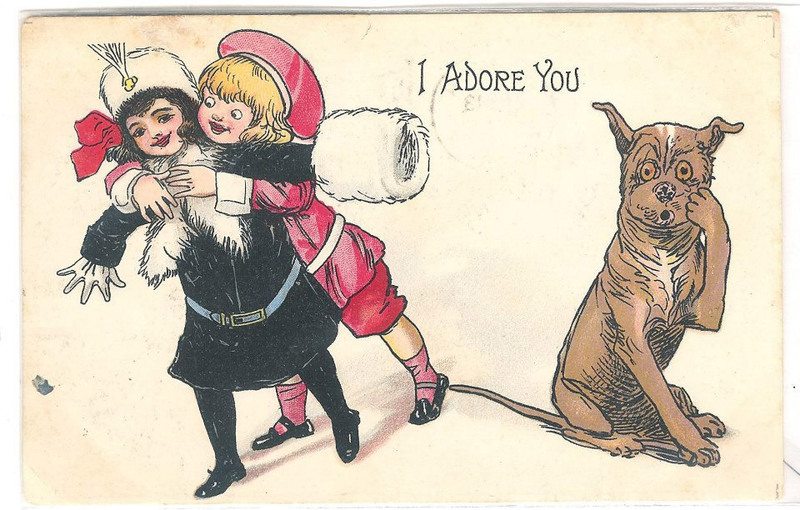 Mamie McFaddin received this postcard from an anonymous admirer in 1909; and featured Buster Brown and his dog, Tige. Buster Brown was a popular comic strip character affiliated with the Brown Shoe Company. Created in 1902, the Buster Brown comic was the first to feature a talking pet, and each storyline involved Buster tangled in mischief while playing practical jokes, but ended with him punished and a lesson learned. The strip also included Buster’s sweetheart, Mary Jane, as shown on this card. Both Buster and Mary wore shoes of the ever-popular fashion, “Mary Janes,” which is where the style got its name. 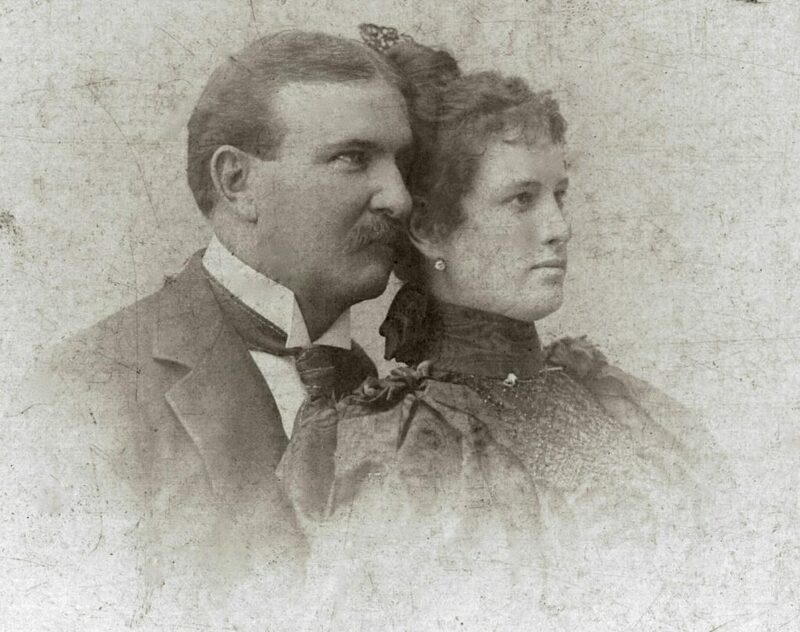 While planning for last week’s Valentine event, we sorted through our collection of McFaddin family postcards in our archives for vintage inspiration. 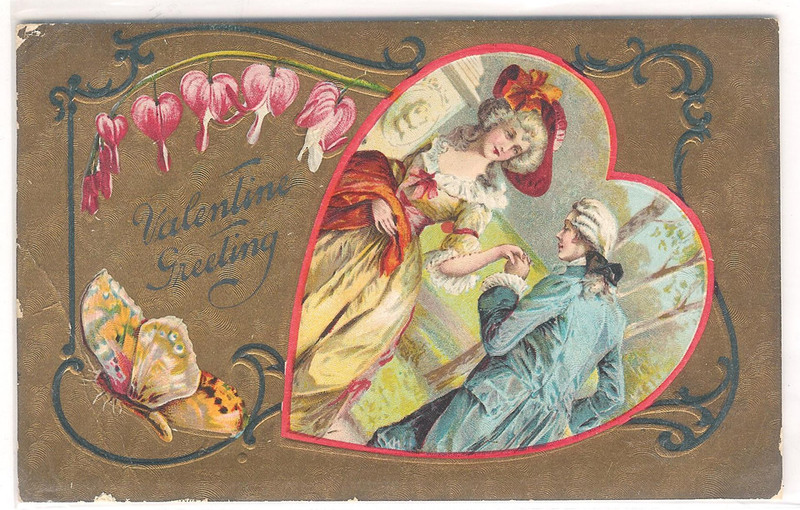 We have many that were sent to family members for Valentine’s day, and this one sent to Mamie from her family in Huntington, WV in 1910, we found particularly beautiful. We’re putting the finishing touches on tonight’s event, Vintage Valentine. Put on your festive frocks and come on down for an evening of fun! Everything starts at 6 p.m.
You’re invited to attend an evening of sweet traditions from the Victorian Era to today, at the McFaddin-Ward House! Celebrate the old-fashioned, with a new twist! Make the McFaddin-Ward House part of your First Thursday on Calder. Dress in party clothes or your favorite vintage-inspired outfit, come alone or with someone special, and enjoy period music and dance demos. Watch a silhouette artist at work, sample chocolate treats and champagne, learn the language of flowers, make a Valentine, and enjoy interpretations of Victorian etiquette while you tour the first floor of the museum. Hear musical stylings by vocalist, Adrienne Ryherd and jazz pianist, Caleb Fontenot. Tour the first floor of the museum for free. Sample champagne and chocolate and watch a recipe demo. See an old-fashioned silhouette artist at work. Learn the language of love with flowers, with Jackie Steen. Have your photo made on the front porch of the museum. Make your own vintage valentine. Learn new moves from dance instructor, Rebecca Woodland.